For a little over a year now, my daughter asking every now and again to go out and try our hand at steel wool spinning. Secretly, I had also wanted to try it. I was hesitant because I saw all the dangers involved. Last night, I threw all my worries aside and we did; and nothing bad happened! As a matter of fact, it was fun! I was only brave enough because we had snow on the ground and we did it with safety in mind. The people that are doing this near items that could start on fire are crazy. The first clip end will clip to the suet feeder and the second makes it easier to hold and acts as a swivel during spinning. We had one outside and used it. I wanted something that enclosed the steel wool. The cage was a good solution. Each grade of steel wool does spark differently. We will be experimenting with the different grades over the next few attempts. 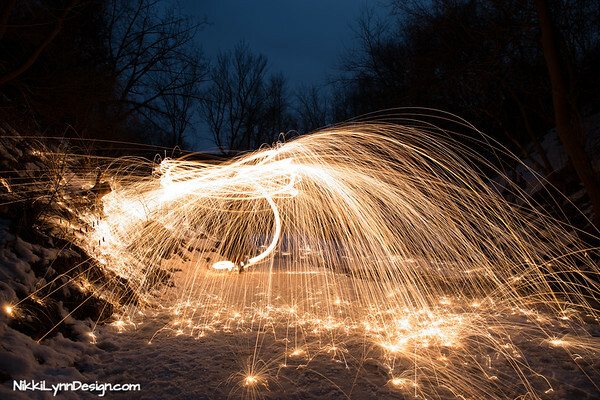 For all of our pictures below we used Super Fine 0000 steel wool. You need something to light your steel wool. You can use a lighter or 9V battery. You can touch the contact end of the 9 volt battery to the steel wool to start the wool sparking. Although, we found it easier to use a lighter because we could see what we were doing. 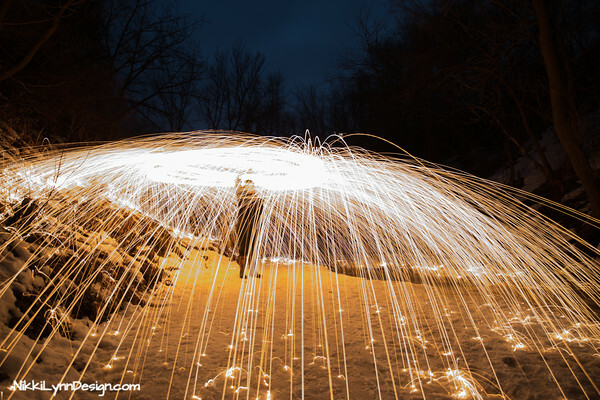 When it is dark, it is sometimes tough to see where the steel wool is. It is a personal choice. This is important for females. It tucks all your hair under the hat. You don’t want singed pieces of hair, do you? Gloves keep you hands protected from the sparks. You want to protect all parts of your body from the sparks. Long sleeves and pants are important. The hoodie also keeps your hair protected. For my daughter, we most certainly needed the extra cap to tuck in her long hair. You might not need the cap. A hoodie is a must. Again, protection and safety. Do you really want your spinner to be closing their eyes while spinning? Under $3.00, they are important. The steel wool may still have a glow to it after spinning. We found a bucket with water to be a simple fix. Dip the hot basket into the the bucket before opening it to remove the steel wool. With spinning our sparks landed on the snowy ground. I still used extra caution though. Having a fire extinguisher is important and it gives you peace of mind. 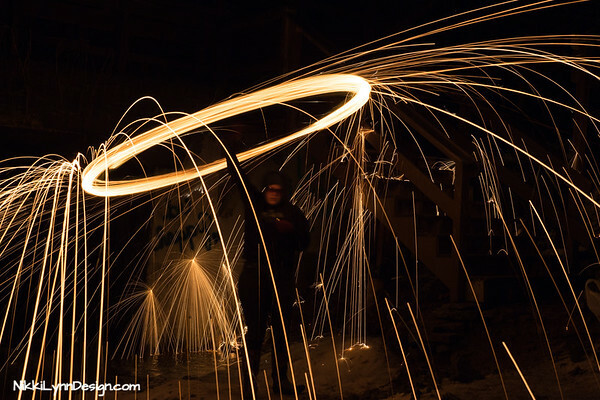 Any stable tripod will do for steel wool spinning. It makes life easier. You will not have to set a timer to reduce camera shake. 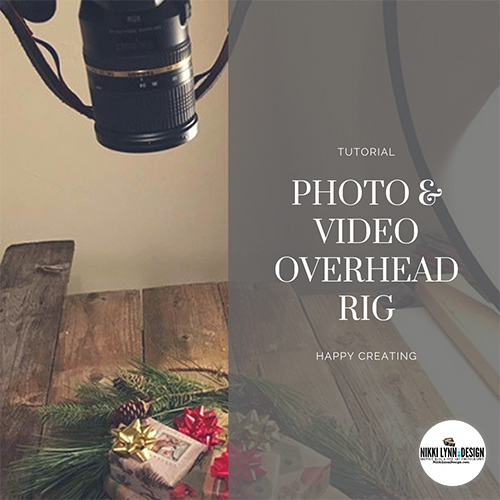 Giving your camera extra vibration stability from your finger depressing the shutter. Otherwise, you can use an Intervalometer , which is what I would purchase if you wish to do any additional types of low light photography. I love it for stair trails and photographing the northern lights. It acts like a shutter release and you can also time between shots and your shooting time duration. 1.) I set my 6D Canon Camera on my tripod with my camera in manual mode. 2.) I plugged in the remote shutter. 3.) I flipped the switch on my lens to manual and turned OFF the IS. 4.) Focus lens to infinity. Read HERE under my shooting the moon. 5.) I set a high ISO to check my focus and get a test picture. I was shooting in RAW, so I didn’t have to change my white balance. If you don’t know what I am speaking of, then change your camera’s “white balance” to tungsten. You can try manual mode with a shutter release cord or BULB mode with an intervalometer. Bulb mode will allow you to get past 30 seconds. The exposure time needed all depends on the amount of ambient lighting and the effect you would like to achieve. I used my intervalometer. Settings below. I still will have to play a bit with settings and time. I see many of the pictures were overexposed. That is only a minor fault. What we took away and learned from the night was the reason you TRY. Next time, we will have additional information to go on. Reading alone will never prepare you for each and everything you will need to do. Living the experience and going through the motions will give you the concrete information for future outings. Set Delay – This adjusted the time to 3 seconds. I have to set at 3 seconds for everything. This is the time between pressing “start” on the intervalometer and the first photo. Long – This is how long the shutter remains open. You can only use this setting if you’re shooting in bulb mode (B). Mine, played with 25 and 30 seconds. Interval – How long between shutter clicks. Not important for this project. N – The total number of shots you would like to take. Again, this is not important here. It is for time lapse photography. Sound – Normally, I say turn it off. Evenly spaced beeps during time lapse photography will drive you insane. For wool spinning, it doesn’t bother me as much. If you have never used your camera in manual mode. It is best to understand how to use manual mode before you attempt this type of photography. Your camera will not auto focus at night, so manual mode is the only way you can achieve this kind of photography. The reason I set a high ISO is to check my focus. It will take about a second to achieve a photo. From a test shot, you can get a good idea of your focus and what your end result will be. As you can see, my focus is off. My daughter is blurry. It took a few test shots to get everything correct in camera. This gave her time to get comfortable with spinning. I switched my ISO to stay within the 100-200 range after checking the focus. For me, I like to keep noise at bay (amount of grain in the photo). This was a test run, to set up the camera correctly and for my daughter to get used to spinning. It takes a little bit to get everything correct, both in camera and for the spinner to get a good feel of spinning. We learned that the sparks can travel, far. Further than one might think. You need plenty of wide, open space. On more than one attempt, the sparks would pass behind me. I would have been scared if we didn’t have rocks and snow to work with. Use caution with ANYTHING around you that could start on fire. You are working with sparks. In many of our shots we had motion because I was yelling “Back up! Back up!” My daughter would back up the extra feet of distance she had before hitting rocks. 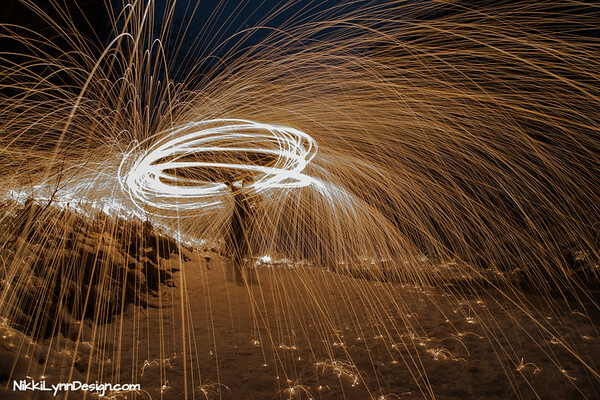 Next time, we pick a location that we can be further away from one another for steel wool spinning. For tonight’s purpose of testing, the location was “ok.” The background wasn’t our focus and it was picked because we are plenty of distance from trees. The focus was technique, camera setup and safety. 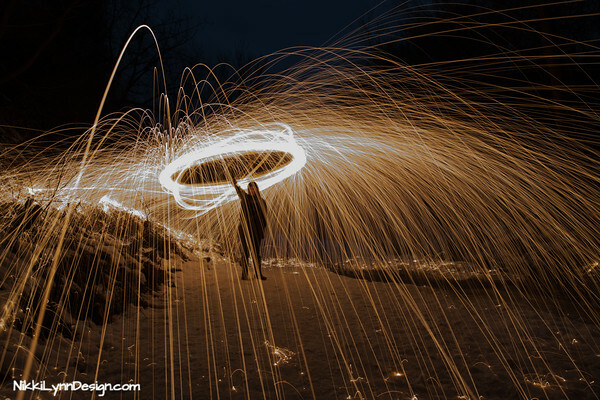 How fast you spin, the motion you use and the grade of steel wool will all affect the end product of your photos. I like the long exposure pictures of 25 – 30 seconds. They really pop. Trial and error and just letting loose and having fun is what this process is all about. After we were finished spinning, we waited 30 minutes to be sure that we didn’t have any sparks lingering. It appeared that all the sparks went out as soon as they hit the snow, just erring on the side of caution. Plus we had a few things to pick up and disassemble anyway. Night one complete. We have a wealth of information from our first attempt and some new ideas that we would like to try for our next outing. I could see a serious addiction coming on here. It is a rush of adrenaline that brings me back to my high school days. 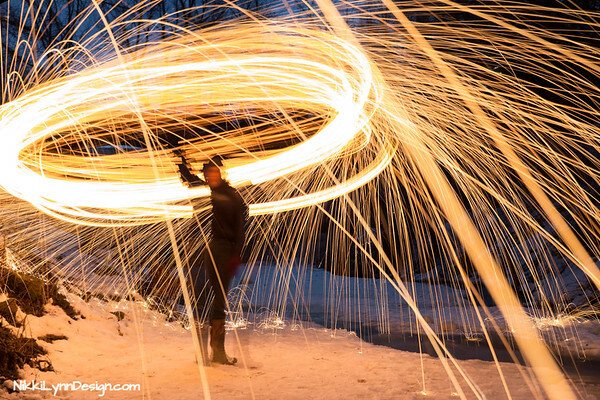 Look for more steel wool spinning to come. Now, we just have to try and track down locations that are safe. Think water, rocks, and concrete here.